Leave the town and go back to the cave where a Business Scrub sold you the Bottle. Stand on one of the slabs to the left and create a clone on the other slab. Together, push the big block as far as possible. Leave from the top, then go southeast of this area. Upon arriving in the Western Wood, go on south, then west and north, to the Wilds. Try to get past the Wilds and Ezlo will inform you that you are lacking something. 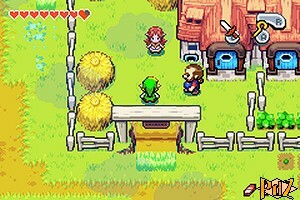 Go back to Hyrule Town and get in the shoemaker's shop in the western district. While Rem is falling asleep, stand on the vase, shrink, then climb on his desk to the right. 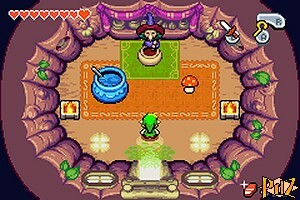 Talk to the Minish who tell you to pay a visit to the witch Syrup. Leave the town from the northeast. Blow up the small rocks, then go south. Get in the pen of Lon Lon Ranch. Speak to Malon and Talon, then go to the top and shrink. Get in the house, go back to your size and shatter the pots to find the Farm's Key. Shrink again, get out, go back to your usual size outside, then talk to Talon to give him his key back. Go back in the house, go to the room on the right and get out. Go on north, go down the stairs and open the chest to find another Big Wallet. Get out of the pen from the right, then go north, then west and use the Cane of Pacci on the hole. Jump into the tornado to the right, fly south towards the higher grounds, then go to the next tornado and fly southeast to cross the pond. Go on to the southeast to get into Lake Hylia's area. And go on southeast to get back into the forest. Go south, then go east and enter Syrup's shop. Talk to the witch, then lift the toadstool and talk to her again. Buy the Wake-up Mushroom for 60 rupees, then get out and leave the woods. 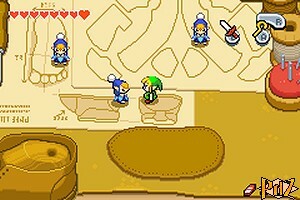 Upon arriving at Lake Hylia, go straight to the left and push the rock to create a shortcut. Go back to the town, to the shoemaker. Speak to him to wake him up and you will receive the Pegasus Boots! Go back to Swiftblade to resume your training. This time you will learn the Dash Attack! Leave the town from the south, go back to the West Woods, then to the Wilds.